For the first two weeks I was in Israel I made the foods that were familiar to me. Beef stew, pasta and sauce, even Pad Thai. But this week I was ready to embrace the beautiful flavors and ingredients that are so readily available to me and start creating something with some Mediterranean flavor. I’m obsessed with the figs here. They’re everywhere, they’re ripe, they’re bursting with color and flavor. I knew I wanted to do something with that. 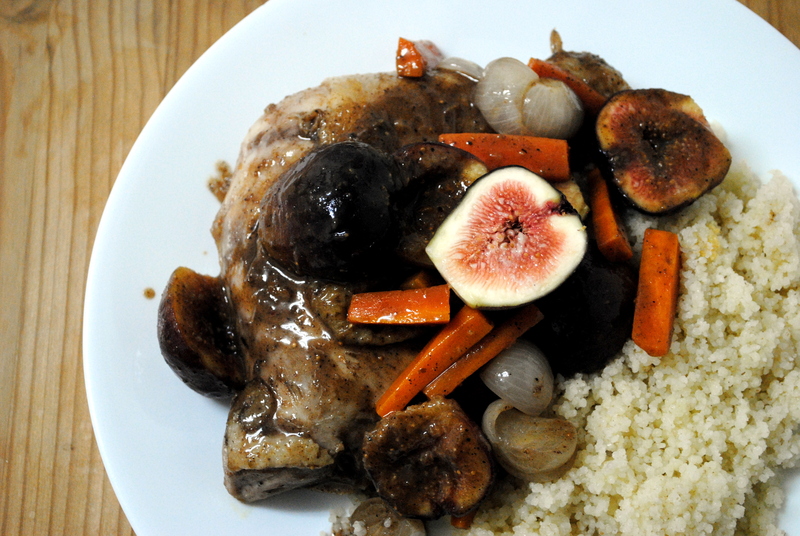 Searching my cookbook collection – ie, the internet – I found the perfect recipe: Chicken with Figs in Ras-el-Hanout and Couscous. I had to laugh when I saw that the recipe, published in a 2009 Bon Appetit, is from Mourad Lahlou, one of my favorite chefs and people of all time (seriously – if you haven’t been to Aziza in San Francisco, go). That sealed the deal. The dish was easy to prepare and a treat to eat. I made it mostly according to the recipe but made adaptations based on what I had available. Ras-el-hanout is a spice blend popular in North Africa and the Middle East made up of cardamom, clove, cinnamon, ground chili peppers, coriander, cumin, nutmeg, peppercorn, and turmeric; every spice vendor has their own blend. The blend I got at the shuq is definitely heavy on the cinnamon with the other flavors coming out slowly, one at a time. It added depth and soul to the meal. 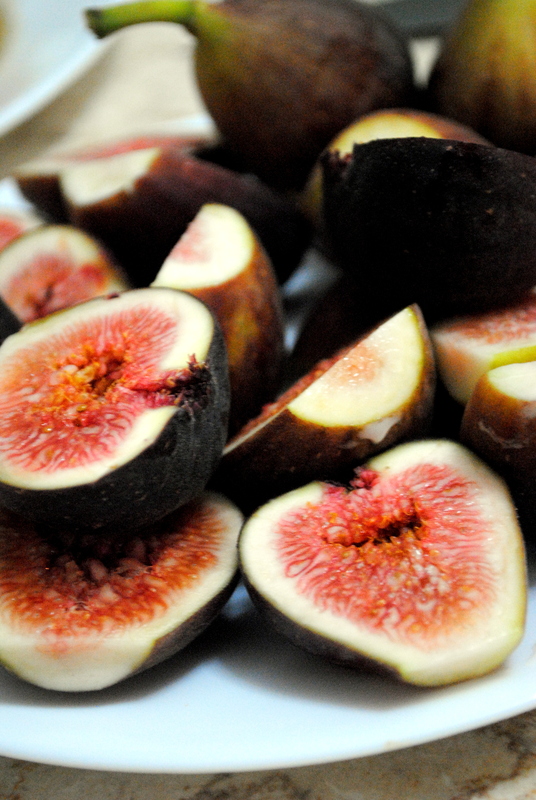 The real stars of the show,though, were the figs. Where the ras-el-hanout lent richness and complexity the figs brightened everything with their slight sweetness to offset the savory sauce. And a note on the cous cous here – it’s fresh. I felt the difference when I first touched the grains; they were light and fluffy instead of hard grains. I love cous cous at home, but this is just in another league. Arrange chicken in a baking dish and sprinkle each side of each piece with 1/4 teaspoon salt and some ras-el-hanout. Cover with plastic wrap and chill for an hour, or overnight. Preheat oven to 350°F (175°C). Heat 1 tablespoon oil in large nonstick skillet over medium-high heat. Transfer chicken to skillet and sear until golden, 5 to 6 minutes per side. Transfer chicken to baking dish, skin side up. Add the remaining 3 tablespoons olive oil, carrots, shallots, garlic, 1 teaspoon thyme, lemon peel,and ras-el-hanout to the skillet and cook just until vegetables are tender. Add the chicken broth and white wine. Bring to a boil, whisking up brown bits. Pour mixture over chicken in baking dish and bring to a simmer over medium heat. Cover with foil and transfer to the oven. Braise 1 hour, until tender. Transfer chicken, carrots, and shallots to baking sheet or plate. Pour pan juices into large saucepan. Spoon off fat from surface. 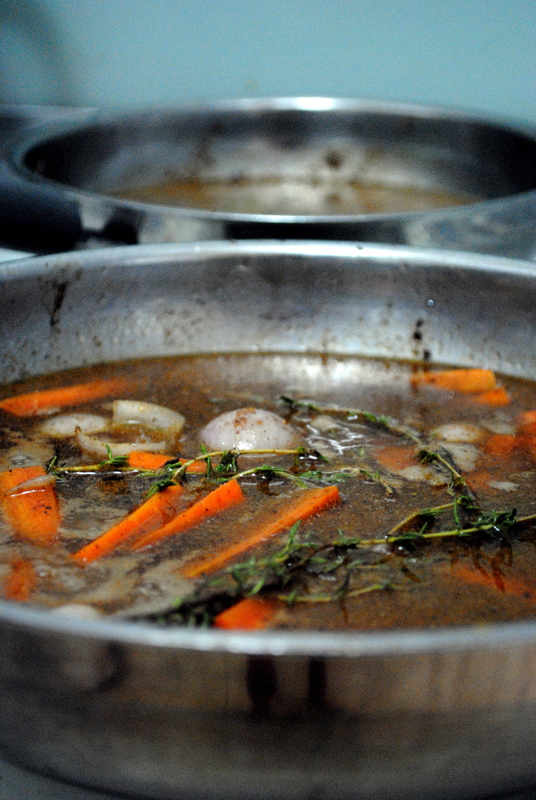 Boil juices until reduced to desired thickness, whisking occasionally, about 20 minutes. 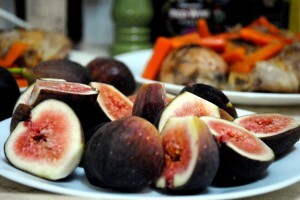 Add figs and vinegar; cook until figs are just heated through, 3 to 4 minutes. Season with salt and pepper. Place cooked couscous on large plate. 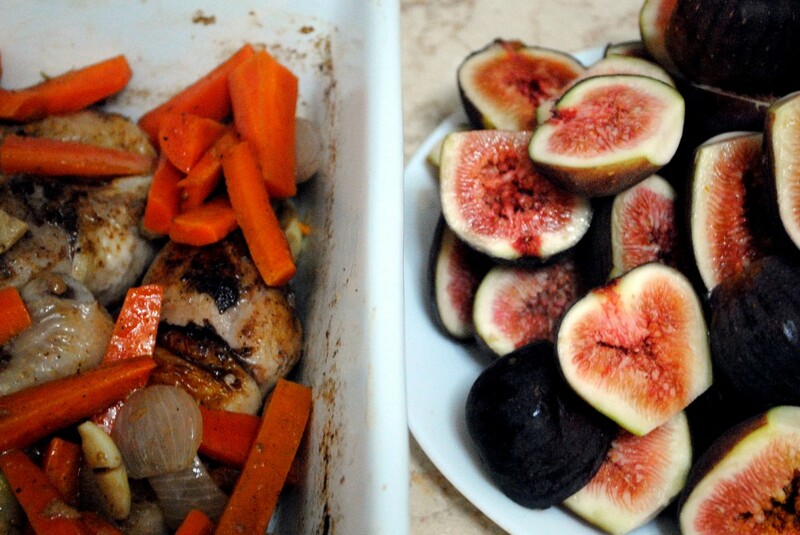 Top with chicken, vegetables, and figs. Spoon sauce over chicken and figs. Garnish with fresh herbs and serve immediately.